It is unwise for a batsman to specifically make up his mind where he will be hitting a ball even before it is bowled, unless the circumstances are exceptional, like a specialist batsman wanting to keep the strike with a tail-ender at the other end, or a situation wherein a team needs to accelerate with several wickets in hand. At the time of taking strike, the batsman should know the exact position of every fielder. Only then will he be mentally conditioned to placing the ball in the right areas. The batsman should adjust his shots to give the greatest yield. There is no point in thrashing hard drives straight to the men in the covers and not getting any runs, when the same deliveries could have been played on either side of the fielders with soft hands, and the batsmen would have got ones or twos. The art of placing the ball in the right areas can be acquired through match-practice. It cannot be learnt and mastered overnight. A fast scorer is not one who slogs. A 'slogger' is bound to fail most of the time. On the other hand, a batsman who is constantly looking for scoring opportunities will come out on top. He who concentrates on picking up singles by punching the ball through the gaps will be more successful. Watching two batsmen steal cheeky singles from right under the noses of the fielding side can be an exhilarating experience for a cricket spectator. Good and effective running between the wickets is a matter of judgment and experience. It is generally accepted that the striker is responsible for calling when the ball is hit in front of the wicket, whilst the non striker shall make the call when a stroke is made behind the wicket. Either party must obviously have the right to deny the partner's call if he thinks it is too dangerous. In such cases, it is important that the denial of the call be loud, clear and prompt. Under all circumstances, the initial call by the striker or non striker should be "Yes" or "No", and "Wait" if there is any uncertainty. If the ball is stroked to third man (behind the wicket) and the batsmen set off for a run, the non-striker while crossing his partner should tell him whether a second run is possible or not, as the ball will be in his direct line of vision. While taking runs, a batsman should pay due regard to the running speed of his partner. It is essential to ensure that each run is just as safe for the partner as it is for him. 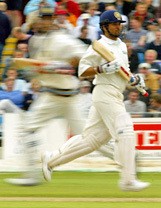 quick single against England at Leeds, 2002. The non-striker should 'back up' as the bowler runs in to deliver the ball. His feet should be outside the popping crease when the bowler releases the ball. However, his bat should be grounded within the crease. The bowler can run him out before releasing the ball if he discovers that the non-striker has 'backed up' too far and hasn't kept his bat grounded within the crease. The non-striker should always stand slightly wide of the stumps. While completing a run, the batsman should ground the bat short of the popping crease and slide it over. The first run should always be run fast. Once the first run has been completed and a batsman is in the process of turning for a second, he should always turn towards that side of the ground on which the ball is struck, to check how far it has gone and how close a fielder might have got to it. Quick singles can upset the bowler and fielders. Shrewd batsmen are known for making mental notes. They figure out who among the fielders are agile, who are slow, who have good throws, who struggle to make quick returns, and who are right-handed / left-handed. Even if a run-out looks inevitable, a batsman who is sprinting between wickets should never ever give up. Many a batsman has made his ground safely because the wicketkeeper or bowler or fielder has fumbled with the ball in his excitement to run the batsman out, or a fielder has made a wild throw. If the bat is dropped accidentally while running, one should carry on running instead of stopping and picking it up! If a specialist batsman and tail-ender are at the crease, the latter should sacrifice his wicket if there is a run-out situation. This also applies when there are two specialist batsmen in the middle. A batsman who might be struggling to time the ball should sacrifice his wicket if his partner has settled down the crease and is playing confidently.